Advantages: Process of building well described at various skill levels; plenty of photographs; interesting schemes; useful weathering techniques; handy list of reference books; includes colour chart. Here we have a very good introduction to modelling the “Bent-Wing Bird”. Mr Green begins with a short introduction to the Corsair's development history, and a list of variants that takes up two pages all by itself. Then he discusses the kits available in all scales, with their plus and minus points and again a list of those available when the book was written. Next are four pages of reference photographs of preserved examples, including some very handy shots of engine details. The first modelling chapter is at Master level, and backdates the Trumpeter 1/32 scale F4U-1D to an F4U-1 with several resin conversion and accessory sets and a good deal of scratchbuilding to provide missing details and improve what’s in the kit. This chapter shows just what can be achieved by a skilful modeller and provides a standard to aim at. Like all the other models in the book, the whole process is described and exactly how to do it is shown in photographs. Then to start improving your modelling skills there’s a 1/72 scale build of the Tamiya F4U-1A, at Intermediate level and using only basic accessories to make small improvements. This is a great chapter for those wanting to know how to improve their models, giving just the information they need. The next model is at Advanced level and converts the Hobbycraft FG-1D to a Fleet Air Arm Corsair Mk II. Here Brett shows how to use more aftermarket accessories to good effect in correcting the cockpit and engine as well as replacing other parts with better ones. An excellent follow-up to the previous chapter for those wanting to go a bit further in the detailing process. 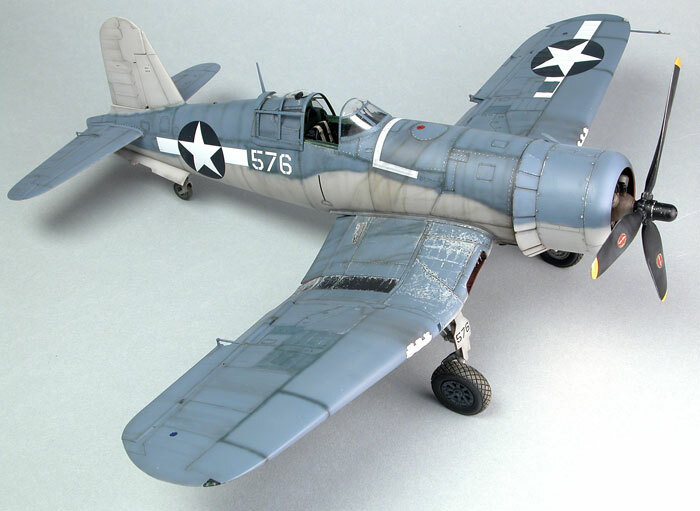 An El Salvadorian FG-1D comes next, at Advanced level and again using aftermarket parts to add or improve the details of Tamiya’s 1/48 scale F4U-1A. The next build is another Advanced level item, this time building a Korean War close support F4U-4 by converting Tamiya’s 1/48 F4U-1D with a multimedia conversion set from CMK and several other aftermarket sets and accessories. Again, it’s a step further in improving one’s skills. Going back to Intermediate level for those who don’t feel quite ready to tackle the previous three conversions, the next model is a simple upgrade of the High Planes’ 1/72 scale F4U-5 or 5N kit to improve its details. This is a small company product using low-pressure injection of the plastic into its moulds, and we are shown very clearly how to deal with the problems that this kind of manufacture can throw up. The final chapter has been contributed by Steve Palffy and is again at Intermediate level and in 1/48 scale. This time we are shown how to improve Hasegawa’s F4U-7 with a few tweaks using simple methods plus a set of aftermarket wheels. Each chapter includes painting notes, and in every case the most appropriate aftermarket sets and decals are named so following the steps described will be simple even if the work seems challenging until you get the hang of it. All photographs are in colour and there’s a handy list at the end of good reference books and useful websites. A great handbook for Corsair modellers, and highly recommended.